« The well-poisoners – Iron Range drinking water is contaminated-The State of Minnesota knew and did nothing. Citizens of Northeastern Minnesota begin to awaken to the real dangers and pitfalls of Non-Ferrous Exploration and Mining! Three major steps! Watch the Videos below. Three major victories occurred for people in Northeastern Minnesota in October. Although these victories are very significant they are only temporary. We only have a few months to slow the Mining/MN Political juggernaut that thinks Copper mining is the only alternative for Minnesota. October 9, 2011 Stony River Township Meeting Video The citizens of Stony River Township met to learn more about Non-Ferrous mining and to sing the unanimously passed Moratorium. MN Executive Council Postpones 77 mining leases Video The Minnesota Executive Council, primarily at the insistence of Governor Dayton, responding to the outrage of citizens directly effected by drilling and some would say heavy handy policies and antiquated land lease laws that favor mining over citizens, correctly, but only temporarily held off on issuance of 77 mining leases. 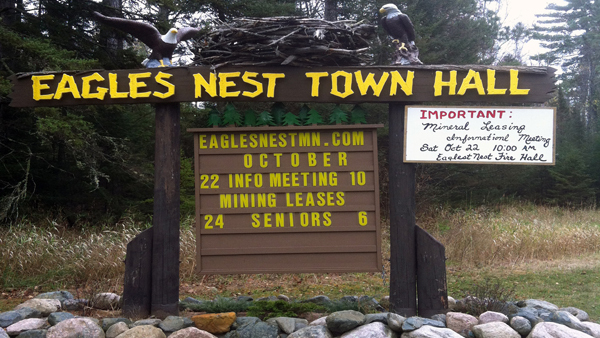 October 22, 2011 Eagles Nest Township Meeting Video Dan Humay, a supervisor in Eagles Nest Township, gave an impassioned plea and inspiring presentation in support of the Stony River Township Moratorium and encouraged citizens in attendance to act now before it was too late. 2 comments to Citizens of Northeastern Minnesota begin to awaken to the real dangers and pitfalls of Non-Ferrous Exploration and Mining! It has become the way of our society to sell America out for the immediate satisfaction that money and properity brings. We are fortunate to be the beneficiaries of true statesmen 234 years ago. Statesmen that foresaw the greatness of America, and were willing to make choices and decisions that would invest in future generations. With approval of the MN mining leases, our leaders will be rebuffing the wisdom of our founding fathers by foolishly cashing in on one of the few investments that America has left. No matter how “careful” the mining companies will try to be, accidents are inevitable as have been demonstrated and documented in previous sulfide mining efforts. In addition to “accidents’, only a foolish individual would not agree that whenever money and greed is involved, there are unacceptable risks that are taken, often resulting in disaster. In the case of non-ferrous mining, there is no room for error, as the result has historically been proven permanent. The water shed is destroyed, plant and animal life is mutated, the livlihoods of many, many people are extinguished in the quaint small towns that exist in northern minnesota. The mining company takes their money, cowers away, and leaves desolation and despair for the taxpayers, townsfolk, and all future generations to deal with. The people that were employed are now once again unemployed, only then there property is virtually worthless as the draw of the pristine waters and wilderness is no longer there. You see, the mining companies like most corporations only care about one thing, and that is the bottom line. They really don’t care about your job, your wilderness, your heritage, your livlihood, or your future. They prey upon the economic stagnation and fear that has consumed the people of northeastern minnesota. While that is understandable, I choose to believe in the resolve, and the wisdom of those that remain. It is my hope, that the people will speak loudly enough and say, no more. We won’t sell ourselves short, mortgage our long term futures, for the greed and power of corporate mining america. If change is to happen, and prosperity is to return to minnesota and ultimately, america, then it has to happen with changes to our societal morals, and values. It needs to start now, and it needs to start here. In short, sulfide mining in northeastern minnesota is a short term bandaid, with rewards that are ultimately short lived and small, and risks that are high and possibly devastating. One thing is for sure. The choice must be made, and all of us must live with the consequences. I pray that wisdom and solid values trump foolishness. Very well said. I suppose those that are willing to take these enormous and foolish risks didn’t leave their campsites better than they found them either. I always wondered who that was that I cleaned up after on the campsite when I got there… Actually, they were probably not there at all which is why they have no respect for the true value of the area and our waters. Look, 400 short term jobs is a ridiculous return for putting at severe and eminent risk the treasure of NE Minnesota. There must be a determined rally by those that have the courage to defend and protect. Rather than pontification and emotional plees, continue to organize a formidable defense. I remember drinking directly from the lake in Basswood and all of Quetico. God forbid the madness actually moves forward!